The clutch above was made using a regular single crochet, but I would recommend using the modified single crochet for this one. The way I graph out patterns makes them easy to read whether you’re using regular single crochet stitches or modified single crochet stitches. With simple shapes and only two colors, this is a great quick weekend project. Planning on trying it out? Let me know in the comments below! And if you have any questions, please feel free to ask away. Happy Crocheting! Thanks Marilyn! I would love to see how it’s coming along. If you have a Facebook account , feel free to post pictures of your work-in-progress on the All Tapestry Crochet Facebook Page. And if you have any questions along the way, don’t hesitate to ask. Good luck! 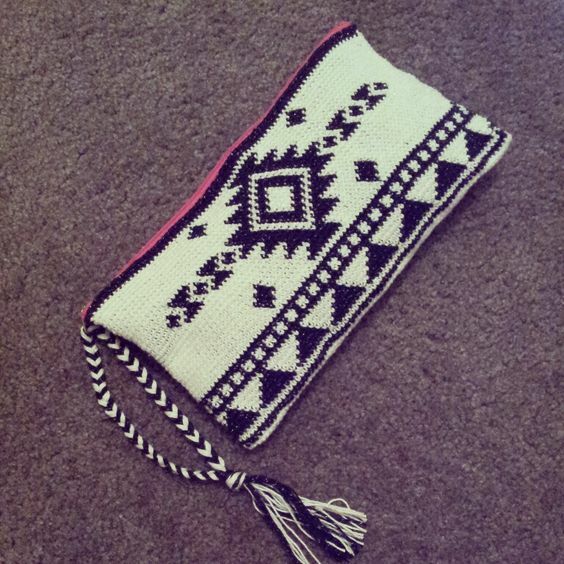 Hi Rebecca, I am trying my first project and think I would like to start with this clutch. Would you be able to post the full pattern? Would you be able to tell me the amount of yarn you used? Any guidance would be greatly appreciated. What method did you use to close this clutch?